Distinctive geometrics and a dynamic finish make this Danya B Contemporary Metal Wall Sconces with Antique Patina Medallions - Set of 2 a bold way to decorate your space. The set's open design allows your wall color to shine through. The wall sconces each include a long cylindrical glass hurricane shade; each holds one pillar candle. Dimensions (each): 4L x 3.5W x 16H in. Weight (each): approximately 1.25 lbs. I assumed they would come with candles, but I can choose the once I want instead. Glass is clean not tinted like the picture. Once I put candles in them I think I wail like them more. Shipped fast. Great piece to put on both sides of a window. 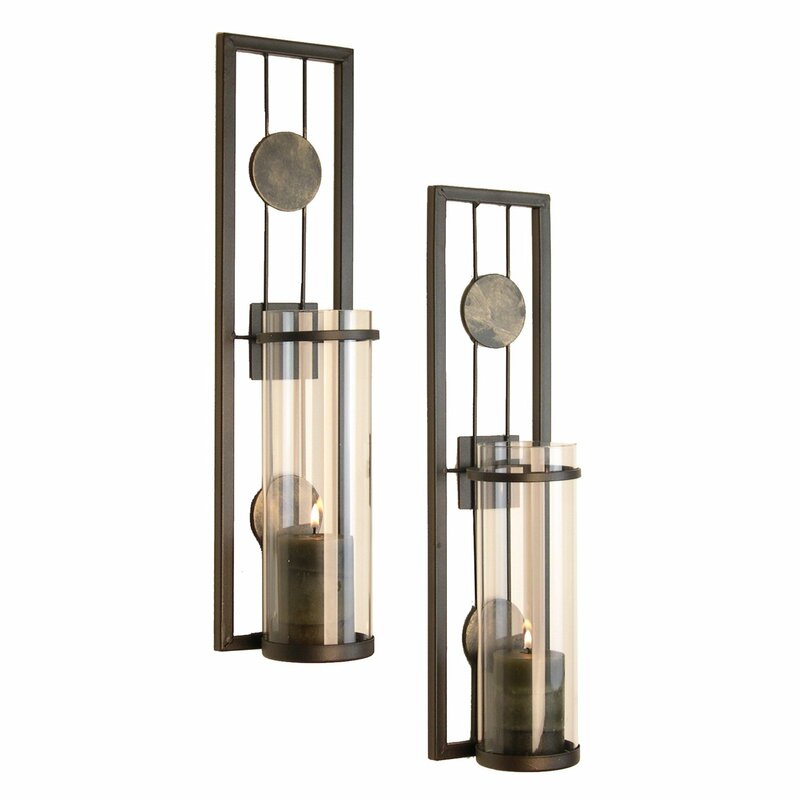 Home territory searches the web to find the best prices and availability on Sconces and related products foir your home like Danya B Contemporary Metal Wall Sconces with Antique Patina Medallions Set of 2. For this page, related items include products we find that match the following keywords: "Sconce" at our vendor partner Walmart - Click More Info / Buy Now to check for price rollbacks!. Danya B Contemporary Metal Wall Sconces with Antique Patina Medallions Set of 2 is one of 69 Sconces and related products available for sale through HomeTerritory.com, If you have any questions on this product, please give us a call at 734-971-1210 during the hours of 9am - 5pm EST for assistance. Thank you for shopping at Home Territory, the home furnishings superstore!